Calcium is the 4th imported element for a plant. The Metrop Calgreen calcium fertilizer is a unique product. The basis of the product is Nitrogen and Calcium in a specific compound. This compound is a building block for the plant cell walls, which results in a more compact, heavier top. 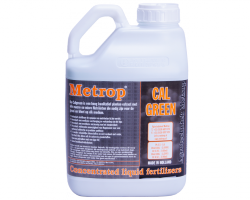 Metrop Calgreen calcium fertilizer also provides 80% protection against most molds and rot diseases. Extra Calcium in the medium ensures that the ions of other nutritional elements are released more easily from the colloidal particles and the plant therefore has more nutritional building blocks available. Metrop Calgreen calcium fertilizer is produced from of very high quality raw materials and can be mixed with any Metrop fertilizer product. With Metrop fertilizers MR1, MR2 and Calgreen, the grower has a top plant food line at hand which, in every medium sees to it that the plant builds up the largest possible root system and top for the highest possible yield.
. Does not contain harmful coloring agents and is not diluted with water: it consists only of the purest raw materials. If the soil is nutrient-rich, give this mixture 1 to 3 times a week. Give daily if the soil is nutrient-poor or if you use hydroponic growth methods. Add Metrop Calgreen fertilizer as last in the mixing tank. Metrop Calgreen calcium fertilizer is biologically degradable.